2. Exfoliating cleanser to remove any dead skin – The Ibuki Purifying cleanser leaves my skin feeling squeaky clean. 3. Hydrating moisture mask – The ultimate in prep – hydrate before you dehydrate! 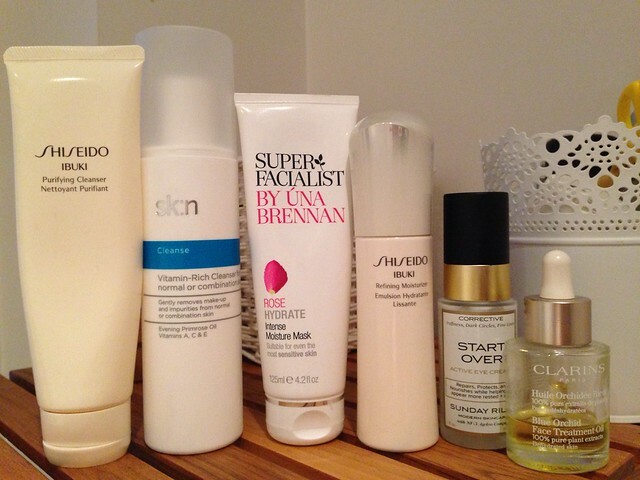 This SuperFacialist by Una Brennan one also has a bit of an extra exfoliating boost too. 5. Moisturise – moisturise, moisturise, moisturise.. if you’re anything like me then you might lean towards a heavier foundation that normal for a night out and this can add to the dehydrating effects of drinks and salty food. So get a good moisturiser (maybe pop a serum in there too) and slather it on! 6. Night Oil – Ok, so I’ve left it a bit late for this as it’s more of a night before – but if you’re heading out on Saturday instead, give yourself a pamper tonight and add some oil. Your skin will love you for it. And there we have it, party-prepped, hydrated and exfoliated skin. About as ready as it can be for an onslaught of booze, late nights and party food…. Happy weekend all! I really want to pick up that Super Facialist Moisture Mask as it sounds lovely and the brand isn’t too overly priced either which I love. I agree prep-work can make all the difference to how your make up applies! I love the Clarins Face Treatment Oils. i want to try some samples please!!!!! i want to try or win or win or try!!! Some great picks – I wouldn’t be without Blue Orchid Oil, it’s amazing (and the smell is addictive). Unfortunately I had a terrible reaction to the Una Brennan mask; my face was burning and the redness lasted for about 3 days. It’s a shame because I’m a bit scared to try anything else from the range now and some of it looks great.